Rolling Hills Middle School, Pajaro Valley High School, Lakeview Middle School and St. Francis High School. For maps and locations, see our Maps Page. Winners of the 10U Robert Lopez team daughter/mom softball game: the daughters! 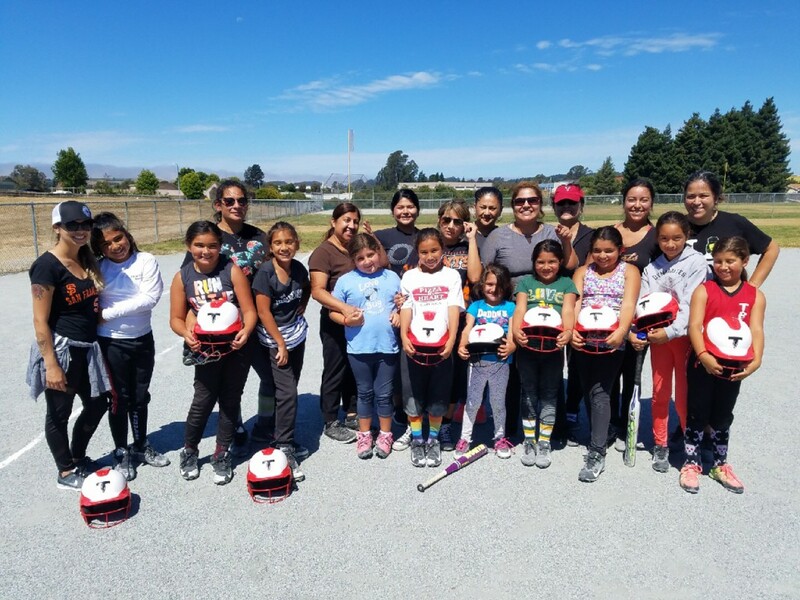 This organization shall be known as the Pajaro Valley Girls Softball League, hereinafter referred to as “P.V.G.S.L.” We are a Non profit organization, Fed ID# 20-0699787….501(C). (a)Tee Ball: Tee Ball is considered an introduction to softball for girls ages 5-7 and as such our main concern is sportsmanship and learning the basics. Score is not kept, all players play the whole game, and all players bat in each inning regardless of number of outs. (b) 10 and Under Division: Since this is still an instructional level we do not want to encourage excessive competition so there are no “standings” in this division. Score is kept to teach the girls that aspect of the game but win/loss record is not recorded. (c) 12 and Under Division: At this level we stress more competition for the girls as they improve their softball skills. Score is kept as well as divisional standings for 1st, 2nd, 3rd place etc. We do however also stress that everyone be given the opportunity to play as much as possible to develop the potential of each and every girl in our program. 1st & 2nd place trophies are awarded. child. (See addendum) At the end of the season trophies are given for 1st and 2nd place. (e) 15 through 18 Division: This is our oldest division of girls and therefore the most competitive. Many of these girls play softball at our local high schools and we want our league to strengthen their skills so that they may better represent our local school teams. We still maintain our basic league objective that any girl who wishes to participate is entitled to the minimum playing standards. Trophies are awarded to the 1st & 2nd place teams. Responsibilities: To achieve this objective the P.V.G.S.L. will provide a supervised program under the Rules and Regulations of the A.S.A. (Amateur Softball Assoc.). All Directors, Officers and members shall bear in mind that the attainment of exceptional athletic skill or the winning of games is secondary, and the molding of future citizens is of prime importance. The P.V.G.S.L. shall operate exclusively as a non-profit educational organization providing a supervised program of softball games for girls ages 5-18.